Everyone surely remembers the killer robot, T-1000, played by Robert Patrick, that rises menacingly from a puddle of molten metal in “Terminator 2”. This scene has inspired the scientists headed by Joseph DeSimone, a professor of chemistry at University of North Carolina and a founder of the Carbon3D company, to invent a new technology of 3D printing. 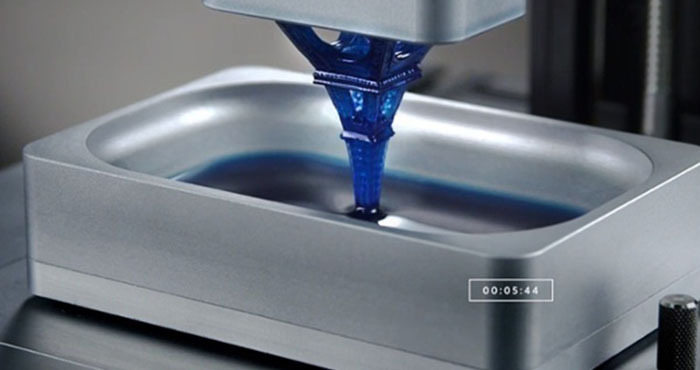 The technology allows to create a 3D object 100 times faster, than the existing methods, from a reservoir of liquid resin. The technique is called continuous liquid interface production or Clip. The printer itself consists of a reservoir of liquid resin and a moving platform, which lifts 3D objects from the reservoir. The printer pulses with light and oxygen. The light solidifies the resin and the oxygen prevents it from solidifying. It works continually, unlike current printers that construct objects by building layer upon layer (so, technically, they make a 2D object again and again). During a demonstration, the Clip printer has produced a hollow geometric ball, and this task took only 7 minutes. It would have taken about 10 hours with a conventional 3D printer! This entry was posted on Tuesday, March 31st, 2015 at 9:25 am	and is filed under 3D, printing, technology. "Kodak Alaris Has Updated Its Scan Station 700 Series"
"New Continuous Inkjet Printers From Videojet Technologies"